The ArcGIS 3D Analyst toolbar is available in ArcMap and ArcScene (when the ArcGIS 3D Analyst extension is enabled) and contains tools you can use on 3D surfaces to interpolate heights for digitized points, lines, and polygons or to create a contour line, a line indicating steepest path, a line of sight, or a profile graph for line results. Use these tools to gain an understanding of patterns in 3D surfaces that are not readily apparent. These tools work with TIN, raster, terrain dataset, or LAS dataset surfaces and provide real-time feedback as you digitize points on the surface. In ArcScene, the result is a graphic. In ArcMap, the result is either a graphic (if not editing) or a feature (if in an edit session with an appropriate target feature class). The interactive tools are not currently available in ArcGlobe, although you can copy the resulting graphics from ArcMap or ArcScene into ArcGlobe. Use the ArcScene button and ArcGlobe button to open either of the ArcGIS 3D Analyst extension 3D applications. 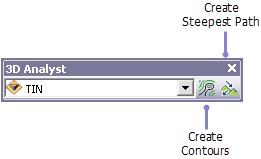 The drop-down menu on the 3D Analyst toolbar provides display and interpolation options for profiles. For more information on these Options, see Understanding the 3D Analyst toolbar options. Certain restrictions exist when working with the interactive tools on the 3D Analyst toolbar and either LAS datasets or terrain datasets in ArcMap. By default, the interactive tools are not enabled unless the LAS dataset or terrain dataset is displayed at full resolution. For more information about using the interactive tools with terrain datasets, see Interactive tools for terrain datasets. For more information about using the interactive tools with LAS datasets, see Interactive tools for LAS datasets. What can you do with ArcGIS 3D Analyst extension in ArcMap? What can you do with ArcScene?